To make sure you know where are the location of SIM card slot and memory card slot on this Galaxy Tab 2 7.0, we assist you with the front view device layout of this P3100. As you can see, the SIM card slot place on the left side of the tablet (portrait orientation), and just exactly below the SIM card slot, there is microSD external memory card is existed. Galaxy Tab 2 seven inches uses Standard SIM Card (some others uses mini SIM card type, but not microSD type). Make sure that the SIM card from your mobile carrier suits for this supported type. Either you use SIM or USIM it isn't a problem. 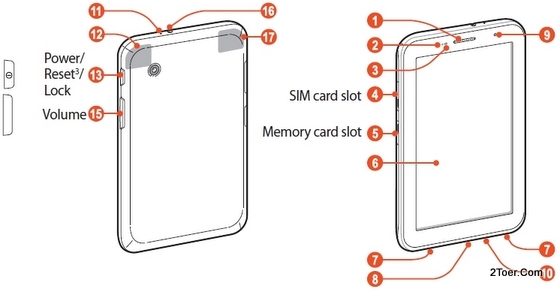 To insert the SIM Card, just locate the SIM card slot on the right side of the device. You don't have to worry about handling this device on its 600 x 1024 resolution display PLS LCD Capacitive touchscreen. It quite tough enough handling your hand grip power. There is a cover on the SIM card slot that you need to open before you able to insert the SIM card. Use the tiny gap between the cover and the edge of slot compartment to pull out the cover with your finger nail. Then with gold-colored contacts of your SIM card facing downwards, just push it into its slot until it reach end. If the SIM firmly inserted, close the cover back to its place. Done. But remember to make the position of the cut-edge of SIM card exactly like it shown on the picture we embedded above (left top). Just below the SIM card slot, there is a memory card slot with its cover. Inserting the microSD (microSDHC supports) is easy. Make sure the gold-contacts facing down and it aligns like the way it is (see the picture) and then all you need to do just slide or push it into the memory card slot. It will locked automatically. Don't push it twice cause it would make the card pop out and unlocked. The capacity capable to be handled on this slot is 32GB. Remember if you have already inserted and used the external memory card, but you wanna remove it from the GTab 2 7.0, you need to unmount it first via Storage Settings. On the table package, the charge utensils are already included with the device. There are three items in there: the USB cable, the Adapter and the plugged jack. You need to assemble the adapter and plug jack first before you can charge the Tab 2 7.0 P3100 battery (The picture didn't show this, but you can easily figure out how to do that after you notice both of this tools: Number 1 is combination between these two). The battery is unremovable and has 4000 mAh capacity. It uses Li-Ion type. 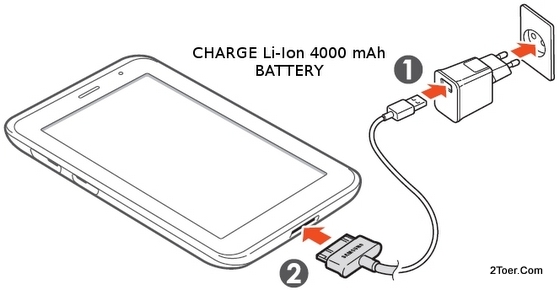 After that, just connect the USB side to the USB Adapter, then the others head side to the charge jack of the Galaxy Tab 2 7.0 (Number 2) and finally connect the Adapter to Power Electricity outlet. And to do Factory data Reset aka Hard Reset on this Samsung Galaxy Tap 2 P3100 / P3110, all you need to do just access the Factory Reset option via: Settings > Back up and reset > Factory data reset > Reset device > Erase everything. If you aren't able to do that, you might need to reset it manually by using hardware button combination (not recommended). If you insisted we suggest that you do it via Samsung Service Center.